Javier Garrido Martinez holds his 4-year-old son after they were reunited on July 11, 2018, in New York. Most reporting on this issue trace family separations back to the announcement in early May of a new "zero tolerance policy" at the U.S.-Mexico border. At the time of the announcement, Attorney General Jeff Sessions said this: "If you are smuggling a child, then we will prosecute you, and that child will be separated from you as required by law. If you don't like that, then don't smuggle children over our border." But children have been separated from their parents for months even before zero tolerance. A Congolese woman was separated from her six-year-old daughter last November after requesting asylum at the border. Her case was at the center of an American Civil Liberties Union lawsuit filed in February that was later expanded to a class-action lawsuit on behalf of all separated parents. Late last year, KPBS reported on an El Salvadoran father separated from his one-year-old infant in November. According to data obtained by the New York Times in April, between October of 2017 and April of 2018, approximately 700 children had been separated from adults claiming to be their parents at the border. But family separations escalated after the zero-tolerance policy was put into effect in May. By early July, the government said they had nearly 3,000 children in custody, and over 100 under the age of 5. In total, the government acknowledged that they had 11,800 children in custody, but most of those are children who came across the border without their families in recent years, known as Unaccompanied Minor Children or UAC. 2. When did family separations stop? The ACLU filed a federal lawsuit challenging the practice in February, which it called cruel and inhumane. In the meantime, facing a bipartisan outcry, President Trump ended the policy of separating children from their parents on June 20. At the end of June a federal judge in San Diego ruled on the ACLU lawsuit. Judge Dana Sabraw barred future separations and ordered the government to reunite children with parents within 30 days. In his ruling Sabraw noted: "The unfortunate reality is that under the present system, migrant children are not accounted for with the same efficiency and accuracy as property,"
3. Who is still separated? The federal judge set a deadline of July 10 for all children under the age of 5 to be reunited with parents. 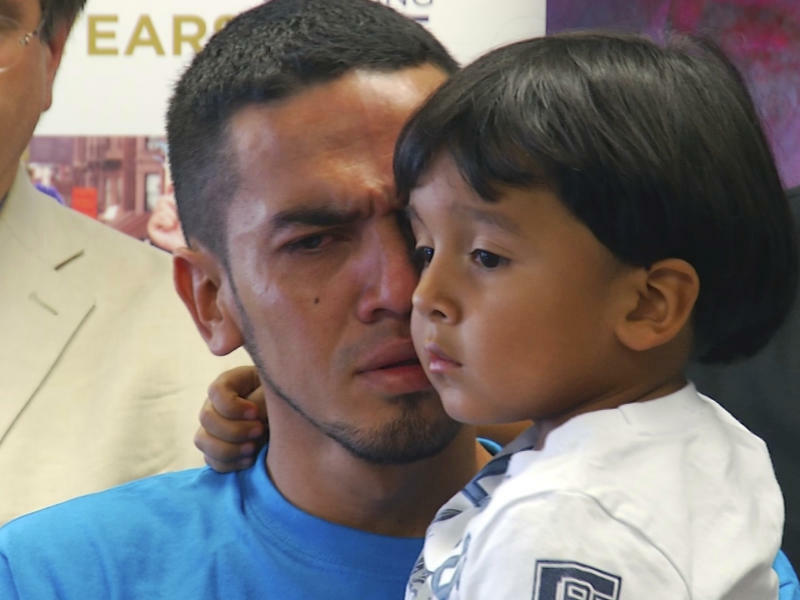 As of July 12, over half of those children were reunited while the rest, approximately 45, were found ineligible for reunification because either parentage could not be confirmed, parents were already deported, or parents had a criminal background which made them unsuitable for reunification. The rest of the children between the ages of 5 and 17 are supposed to be reunited — if eligible — by July 26. In a court filing on Thursday July 19, the government claimed out of 2,551 children in custody, 1606 are possibly eligible for reunification. 364 reunifications have taken place. Another 908 children are either ineligible for reunification because parents have waived reunification or because they are in U.S. Marshall custody, have a criminal background, or need further evaluation. As for the thousands more still in government custody — the UACs or unaccompanied minor children — they are housed in Office of Refugee Resettlement shelters, or are living with relatives or in foster homes provided by the government. 4. What happens to families once they are reunited? The Trump administration would prefer that families detained for illegally crossing the border, or whose asylum claims are being evaluated, be held in immigration detention facilities. However a court ruling from 2015 as part of the long-standing Flores Settlement says children cannot be held for more than 20 days. The Trump administration asked for relief from that restriction, but the judge rejected their request, writing that the Justice Department's argument for relief from Flores was "wholly without merit." Most families that are reunited are released into the U.S. with some kind of GPS-monitoring device, either an ankle bracelet or a smartphone check in device. They have to appear at designated immigration hearings and, if they are seeking asylum, they will eventually be seen by a judge who will decide whether or not their asylum claim is credible. The Trump administration has recently tightened the vetting process for asylum seekers, especially those fleeing gang or domestic violence, and it is expected that the vast majority of immigrants will not be allowed to stay in this country. The government will have to account for all of the children separated from families at the border by the court-ordered deadline of July 26. All eligible reunifications will have to take place by that time, or the government will need to explain why each child was not reunited. At least 12 parents of the under 5 children were already deported from this country. It is expected that that number will grow when the older children are accounted for. The federal government will have to work to reunite those families with their children, if they request reunification. Despite the legal setbacks, the zero tolerance policy is still very much in place for adults along the U.S.-Mexico border. San Diego has begun its own "Operation Streamline," a practice used in other border states to expedite prosecutions of all illegal border crossers. Detention facilities are expanding in Texas and California to hold adults who have been detained. It is unclear if families who are caught crossing the border illegally will be released with electronic monitoring, or will be held in detention facilities while their cases are being prosecuted. Copyright 2018 NPR. To see more, visit http://www.npr.org/.